to relax and have a great meal before or after admiring the stunning collections here is... and we love it because a day out to see Glasgow's most popular attraction deserves a classy meal as well. Remember that Art Lovers Cafe is open at lunchtime and in the afternoon only... and relax over one of the most mouth-watering meals available in Glasgow. What could be nicer than a stroll round Burrell Collection, lunch in a building designed by Charles Rennie Mackintosh, then a wander round his House for an Art Lover? "Nothing! ", we hear you sigh! Enjoy. [A 3 minute drive from Burrell Collection will take you to Art Lovers Cafe. Turn left when you leave Pollock Country Park, following signs for the M77. ... so do you want to know what's keeping those 'in-the-know' folks talking about Burrell Collection? It's... local fans who are real enthusiasts give FREE walking tours of The Burrell Collection. Call for details. These guys really know their stuff, and are happy to take questions. What is already an amazing collection springs to life with their energy and zest for the topics on show. Enjoy! Now... don't tell anyone else. And DO NOT reveal this Burrell Collection top secret file and password. And get yourself onto the VIP list below while it's still open, and I'll drop you a short email every time we reveal something new about Burrell Collection. to relax and have a great meal before or after admiring the stunning collections here is... and we love it because locals like to keep their little treasure to themselves! Lovely, well prepared food in a calm, golden-toned dining room will go down well during your day out at the Burrell Collection. And remember you can grab your own page here to share your tips, photos and stories about Burrell Collection. Have fun! Great news! Finding this page means you can now join our VIP list for Burrell Collection. 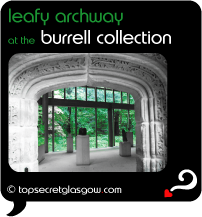 You found the Top Secret File for Burrell Collection. If you don't have a password yet, there are still lots of great things about Burrell Collection in its Buzz Page. ("The Buzz" page is also the place to pick-up the password by taking part). Burrell Collection does not offer any booking services that we know. You can always contact them to check.